The federal government's latest annual deficit is the smallest it's been since 2008, according to Treasury Department data released Wednesday. At $680 billion, the fiscal 2013 deficit is 51% less than it was in 2009, when it hit a record high nominally of $1.4 trillion. As a percent of the economy, it's also considerably smaller than it's been in the past five years, coming in at 4.1% of gross domestic product. By contrast, the annual deficit in 2009 topped 10% of GDP. And last year it was 6.8%. Overall, Treasury said higher receipts accounted for 79% of the decline in the deficit from last year. Several factors have contributed to the strong improvement in the nation's near-term fiscal picture. They include an improving economy and a mix of fiscal restraint -- primarily, the expiration of stimulus measures, the imposition of across-the-board budget cuts known as the sequester, and tax increases on high-income households during the 2013 fiscal year, which ended September 30. Another boon was the fact that Fannie Mae (FNMA) and Freddie Mac (FMCC) paid back a large part of the $187 billion federal bailout the mortgage giants received, starting in 2008, to help them weather the housing crisis. In addition, total interest payments -- $415.6 billion -- were moderate relative to the amount of outstanding debt and GDP, but were nearly 16% higher than in 2012. Overall, spending in 2013 totaled 20.8% of GDP, down from 22% the year before, thanks in part to declines in defense spending and unemployment benefits, as well as the sequester. Among the areas where annual spending rose were Social Security and Medicare. 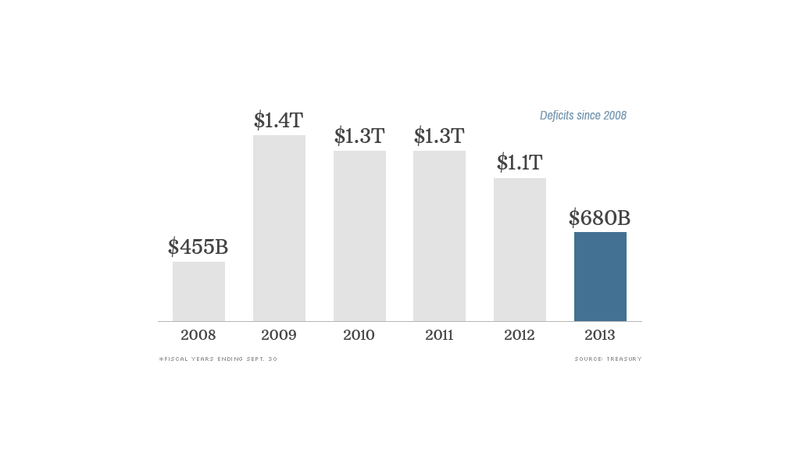 Money going into federal coffers reached 16.7% of GDP, up from 15.2% in 2012. Tax receipts from individuals and estate and gift taxes saw the biggest percentage jumps, and most major categories of receipts were higher too. Treasury's latest data for 2013 were delayed by a few weeks due to the 16-day partial government shutdown that began on October 1. The report also came as a new bipartisan group of lawmakers have begun to work toward a budget deal to at least ensure funding continues for the rest of fiscal year 2014 and to resolve whether or not to replace the sequester. Either way, fiscal restraint is likely to continue for the next couple of years. 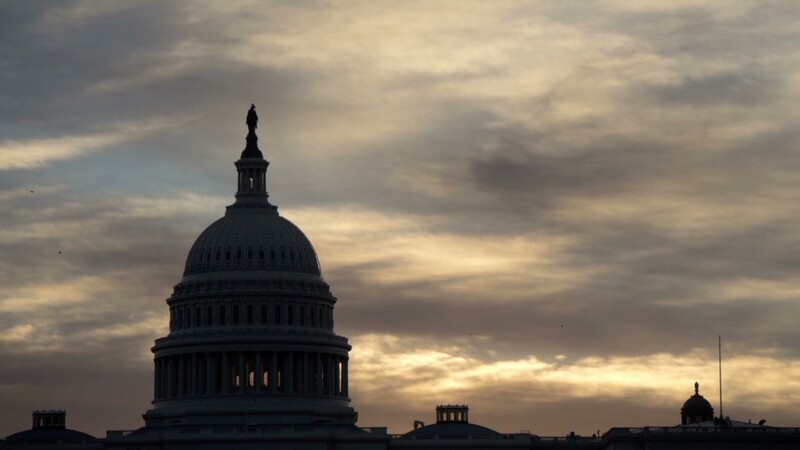 The Congressional Budget Office estimates that the annual deficit will fall to a low of 2.1% of GDP in 2015, before starting to rise again thereafter. Independent budget experts' concern, however, is not about the country's deficits over the next 10 years. Their concern is about the subsequent decades when spending on major entitlement programs, as well as interest on the debt, will consume much larger portions of the budget while revenue is not expected to increase enough to keep pace.